Halibut. I had not heard of this type of fish till we were in one of our meetings at GoFresh. One of the salespeople mentioned that it was almost halibut time* and I was intrigued. What is “Halibut Time”? I’ve learned that halibut is only available for a short period once a year. And Oh Boy are they a fish story to be told. They’re huge fish! I’ve been fishing with my family to get trout but that was just at a local pond. Seeing images of halibut hanging next to grown men, and the fish is bigger than they are, really gives meaning to the idea that fish will grow to the size of their pond. And the ocean is a big pond! If you have never seen halibut, that is because they are flat and do a good job of being camouflaged in the ocean. Their top side is dark to blend into the ocean floor but their underside is white so that it blends into the water if it is seen from underneath. The writers at FishEx say that “Halibut are among the largest fish in the sea and the largest of all the flatfish. They can grow to more than 8 ft long and 700 lbs. Halibut weighing in at more than 100 pounds are often called "Whales", "Soakers", or even "Barn Doors", while smaller halibut, less than 20 pounds, are often called "Chickens". The largest Alaskan halibut ever caught while sport fishing was 459 lbs. in Unalaska Bay. The largest concentration of pacific halibut is in the Gulf of Alaska, with most in the Kodiak Island area. A smaller amount exist in the Bering Sea. Atlantic and Pacific halibut have distinctly different bone structures with that of the Atlantic halibut being easier to cut. Interesting and YUM! But what other benefits are there from eating halibut besides a happy tummy? The writers at Lifestyle Lounge have a whole list and even some cautions. -“Omega-3 fatty acids present in halibut provides a wide range of cardiovascular benefits like it helps in preventing erratic heart rhythms, making blood less likely to clot inside arteries that can cause heart attacks, and improving the ratio of good HDL (High Density lipoprotein). -Halibut is also a good source of vitamin B12, vitamin B6 and folic acid that lower levels of homocysteine, a compound that can damage artery walls. -Halibut is a very good source of magnesium, a natural calcium channel blocker, which lessens resistance and improves the flow of blood, oxygen and nutrients throughout the body. 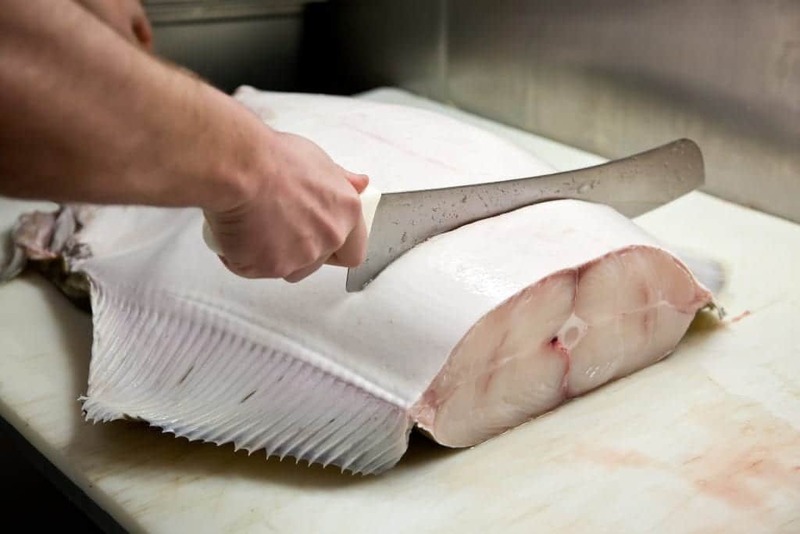 -Intake of halibut improves the electrical properties of heart cells thereby protecting against fatal abnormal heart rhythms and making less blood clot inside arteries. -It reduces blood pressure, prevents arthritis and promotes healthy brain function. -It offers significant protection against both early and late age-related macular degeneration and fends off dry eye syndrome. -Eating halibut fish lowers the risk of certain types of strokes. In addition the selenium present in it is a crucial antioxidant which is very important for a healthy liver. Liver detoxifies and clears potentially harmful compounds such as pesticides, drugs, and heavy metals from the body. -Halibut provides protection against ovarian and digestive tract cancers.